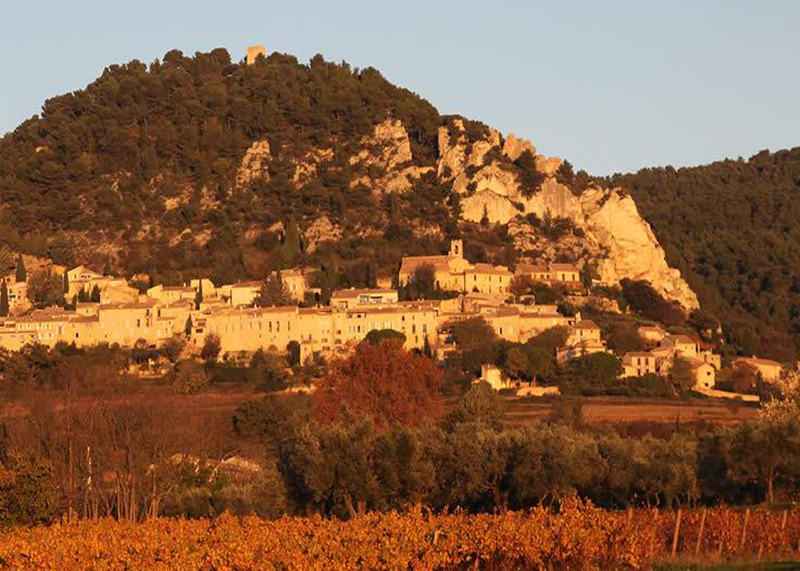 Not only a natural kingdom populated with green oak, aromatic Mediterranean shrub, and stands of Aleppo pine trees, the small rumpled mountain chain called the Dentelles de Montmirail is also home to a group of historically and culturally preserved hamlets like Sablet, Gigondas, and this week’s featured wine source, Séguret. Anchored and rising upward from the jagged lace work (dentelles) of limestone outcrops, the tight cluster of Terra Cotta roofed stone houses, shops, and cobbled alleys reveal the town’s medieval history while evoking more distant roots. For over 500 years as of 1274, this large parcel of land and connecting waterways were part of a Papal realm known as the Comtat Venaissin. Ceded to the Catholic church by various minor French rulers, the enclave was a home for a succession of 9 displaced Popes who had fled Rome due to political revolt. It remained in their control up until 1791 when it was reintegrated into France as part of a new order that followed the French revolution. Geographically framed by the Rhône River bank to the west and the modern boundary of Provence to the south, this desirable region that includes Châteauneuf-du-Pape (the Papal Castle) had already benefited from the agricultural influence of Greek settlers who planted Olive groves, and Romans who developed regionally-appropriate grape cultivars, built terraced vineyards and exported their wine via barge down the Rhône and its tributaries! Winemakers in the Southern Rhône region have been cultivating Grenache Noir and Syrah grapes for at least 14 centuries. Well suited to a regional climate in which daytime heat is tempered by the cooling Mistral breezes, and where the sufficiently long growing season allows the fruit to reach full maturity, these two plump and prolific varieties are the backbone for the Rhône’s signature, blended red wine recipes. In more recent history, Cave Le Gravillas began producing high quality, terroir-specific wines in the mid-1930’s and with multiple generations of practice later, they’ve confidently grown into an internationally recognized brand. Séguret is one of 18 select villages who are permitted to add their name to the AOC designation of Côtes du Rhône – Villages. Generally, ‘Villages’ suggests that their wines are produced under more stringent requirements of planting density, harvest yields, blending proportions and minimum alcohol levels. Whether or not these factors directly translate into a consistently better grade of wine than the more generic standard is debatable, and variable from year-to-year. What’s less uncertain, is that the terroirs surrounding each village, coupled with localized finishing traditions do produce discernibly distinctive flavour profiles. 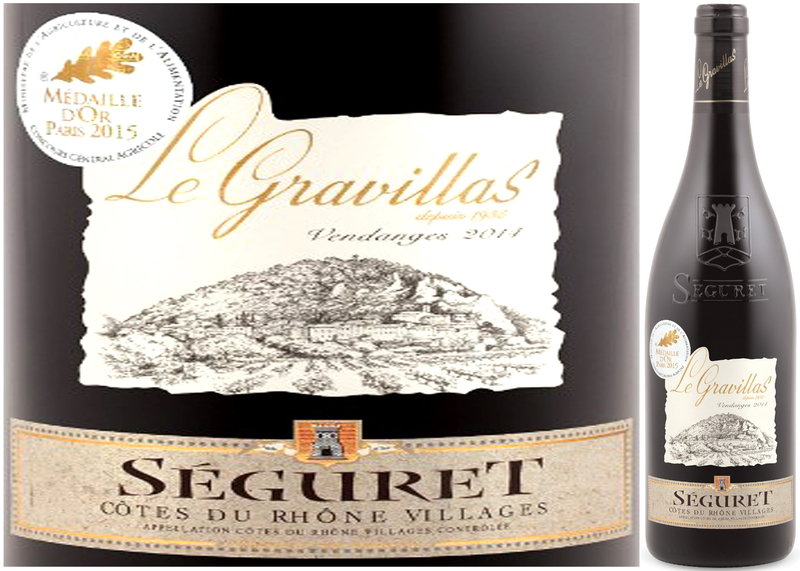 For my tastes, as an admitted fan of medium to full-bodied, earthy, berry-forward wine with polished tannins and less oak influence, this Villages – Séguret 2014 is a balanced bottling that’s equally satisfying when served up as apéritif or with dinner fare. Beyond those baseline credentials, note that it earned a Gold Medal at the Concours Général Agricole de Paris in 2015; in a category always packed with notable competition from the Rhôneland vineyards! As Grenache makes up most of the blend, rich black fruit aromas and flavours dominate this bottling, with the Syrah adding some zippy pepper notes. Try this alongside braised or curried lamb, beef Kefta brochettes or spicy squash tagine. With some justified claim to being one of the Cape’s renowned white grape varieties, the plucky, old, and gnarly bush vines that produce Chenin Blanc thrive, unirrigated, in this dryland region’s crushed granite soils. Challenged by these conditions, the long-lived rootstock has learned to burrow deeply; drawing on the mineral-rich nutrients and moisture that have percolated downward in the rocky terrain. As is often the case with grapevine, environmental stresses promote the development of more characterful fruit; invested with a nuanced layering of flavours. The desirable combination is evident in this DéClassé featured bottling of a historically unheralded, though now renascent, Chenin Blanc wine style. Well suited to the temperate terroirs of the continent’s southernmost tip, this vintner has aptly and evocatively named the offering, Vinum Africa. 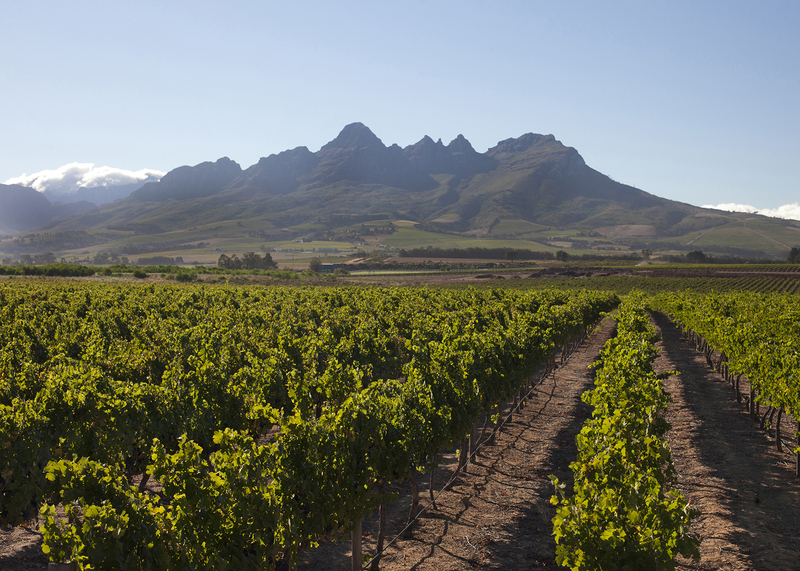 Comprising 20% of South Africa’s total cultivation and output, the winelands of the Stellenbosch region in the Western Cape continue to rise in the competitive ranks of reputation; in the country and internationally. Blessed with a diversity of microclimates and soil composition, its potential was first recognized by French Huguenots who arrived in the 1690’s and immediately began planting vines. The somewhat younger, ocean-facing vineyards of the Winery of Good Hope lining the lower slopes of the Helderberg (bright mountain), are one cornerstone of a farming enterprise that’s at the creative forefront of exploiting the advantages of a dynamic wine region, and its motivated cadre of world-class winemakers. Hands-on harvesting, manual sorting, and careful selection lead the production process where natural fermentation of the grapes takes place in stainless steel tanks. While a majority of the harvest is left to linger on the expired yeast (lees), infusing the batch with some subtle toasty notes, the other 30% is transferred to mixed generations of Oak barrels where it takes on its spice accents. The final blending and resting of both components for several months is a key step in a recipe that imbues the still-crisp acidic fruit with considerable aromatic depth and range. It’s also the measurable distinction for how Chenin Blanc develops a more rounded flavour profile in SA; contrasting the leaner versions that are fashioned in its native France, where it’s known as Pineau de la Loire. 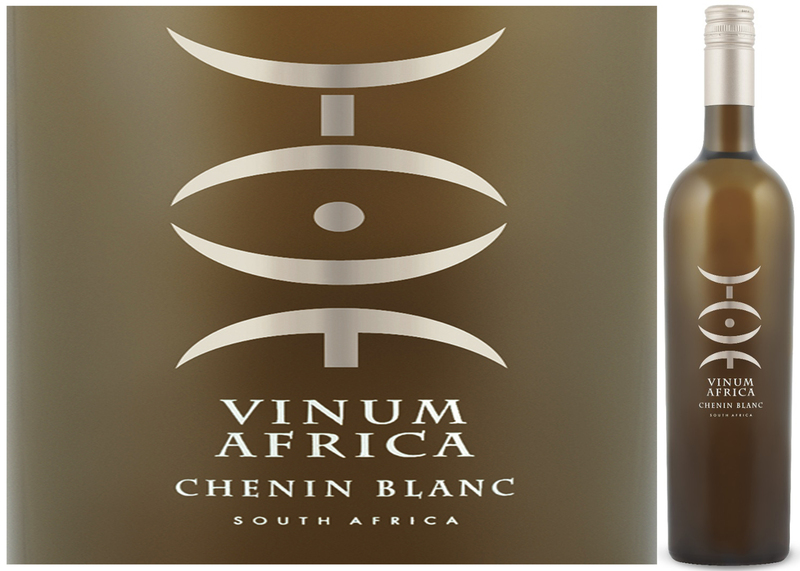 The striking symbol acting as a label combines an ethnic flourish with the Latin term Vinum (wine) and was conceived as an expression of the positive political, historical and social progression in a revitalizing South Africa. Proudly playing out their part, the passion and care of these vintners is palatable in the glass. This is a lovely layered wine, offered at a very reasonable price-point and we’re fortunate to have access to some of the 2,600 cases from the 2013 vintage! Medium-bodied, fragrant and dry, try serving this zesty wine with Mediterranean dishes, grilled vegetables of all sorts, sushi or as a compliment to Asian cuisine. It’s also very satisfying as an apéritif with goat cheese canapés or onion tarts. Among the most exciting of Spanish wine producing frontiers, the El Bierzo DO is a unique part of the autonomous region of Castilla y León. Romans prized this land as a rich mining source of minerals and gold; Christians guarded it with a network of 300 castles and fortified monasteries, effectively containing Moorish expansion in the 8th and 9th centuries; Castilian knight Don Rodrigo Díaz de Vivar (aka ‘El Cid’) is arguably its most famous son; the crusading Templars are its best-known religious order, and Spain’s most iconic Medieval royalty, Ferdinand and Isabella. 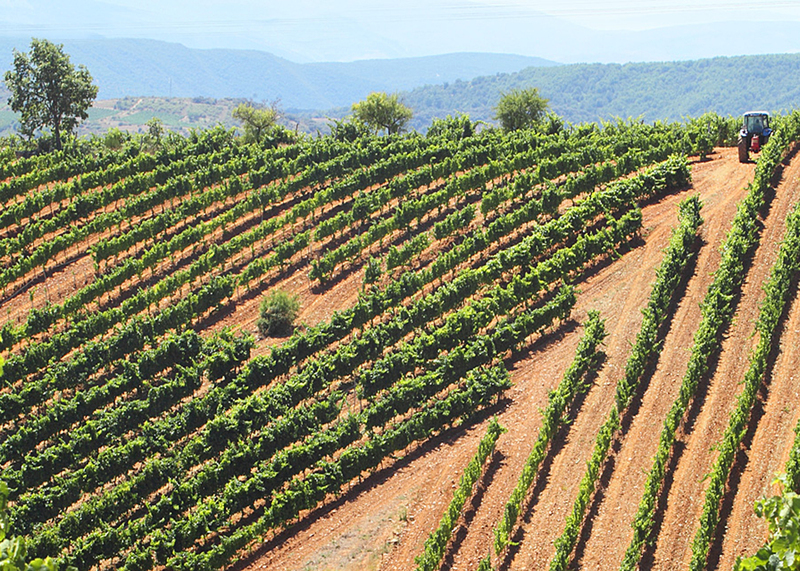 Tucked quietly into the historical legacy is the landscape and the winemakers of the Bierzo Valley. Framed between the Montes de Leon and Cordillera Cantábrica mountains, this square-shaped valley of a fertile plain, surrounding stands of forest and steep vineyard terraces acts as a geographic funnel into the lush northwestern corner of the Iberia. Referred to as the ‘gateway to Galicia’, it’s part of the Santiago de Compostela pilgrimage route, providing the speculation that it was the religiously motivated travelers who first brought vines to the area? Though relatively small as a wine region, its vineyards benefit from an Atlantic influenced maritime microclimate, making it equally conducive to the cultivation of red and white grapevine. Curiously, it remains one of the less well-known Spanish designated DO’s in the attention of international markets–despite the impressive fact that its 55 or so Bodegas are prolifically producing 11million litres of wine annually! Bodega del Abad (the ‘Abbot’s Cellar’) has only been active as an independent producer since 2003, but boasts a loyal following that was expanded by a surprise release several years ago of a 2001 Crianza-grade cache that had been hiding somewhere in the back corners of their cellars. This DéClassé featured 2006 bottling is also surprising. 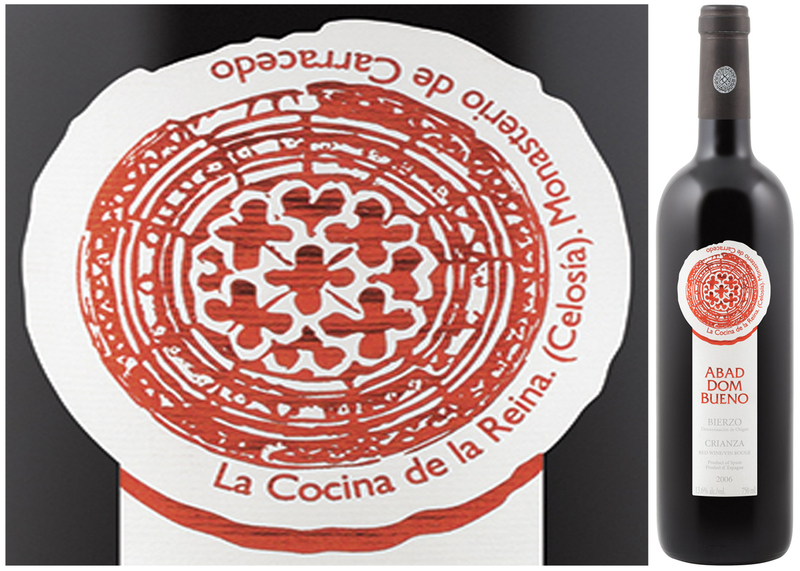 In both cases, the wine is well beyond the mandated 2 years of a combined barrel and bottle aging required to qualify for a Crianza designation. Evidently, this vintner has exercised patience to assure that the vintage has achieved a balance of being fully rounded and mature while possessing fruitful vigour; wrapped in delicious chocolate-tinged flavours. compact clusters of medium-sized, violet-blue berries, its renaissance is based on an ability to generate age-worthy wine, at a relatively modest price point. This bottling is ready to go now but will also hold up for nicely for several more years. It will likely fly off the shelves as word of this formerly hidden gem spreads. So buy enough to get you through the Spring, Summer and Fall dinner seasons! Having aged gracefully, this has soft notes of black pepper and tea leaf wrapped around the juicy cassis, plum and currant flavours. With a core of gentle tannins, try serving this food friendly wine with rich poultry dishes, marinated steak kabob, roast leg of lamb, or spicy beef empanadas.